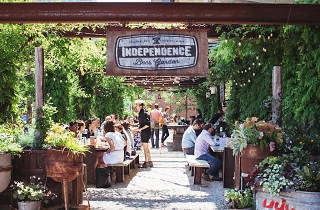 One of the summer’s most-trafficked outdoor bars, Independence Beer Garden appeals to locals and tourists alike, thanks to its next-door-neighbor proximity to major historic landmarks such as the Liberty Bell, Independence Hall and the Constitution Center. 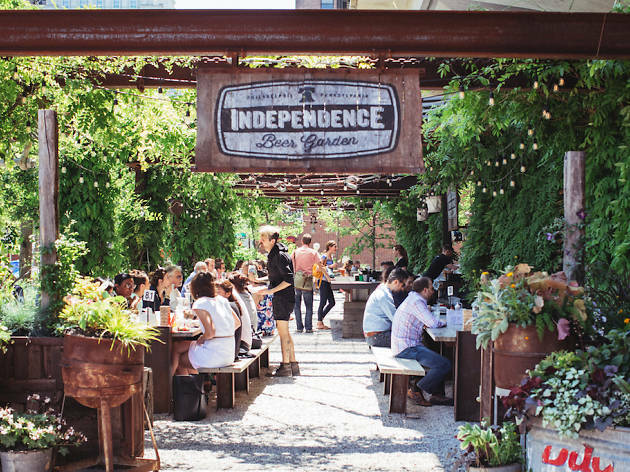 Spread out on one of the many picnic tables—shaded by greenery that’s adorned with twinkling lights—and order from a drink menu that includes 15 beers on draft, including the Yards Philadelphia Pale Ale, Deschutes American Wheat and Evil Genius #Adulting. Nine beers in the $5 to $6 range make up the canned suds list, such as Narragansett, Stella Cidre and the Wisconsin-brewed Leinenkugel Summer Shandy. You also have a choice of wine: a pinot grigi, pinot noir or rosé for $8. Seven $9 cocktails with Philly-centric names are also up for grabs. Those include the Point Breeze, made with rum, grapefruit, maraschino and lime; and the Gin Jawn, a refreshing, summer-approved concoction of gin, mint, lime and strawberry. There’s tons of grub, too. Opt for the large platters to feed hungry groups. These come with a choice of brisket, pulled pork and chicken wings, all served family-style alongside mustard, coleslaw and potato buns. You can also choose from lighter snacks like pretzels, cheese curds and hummus; fried chicken, cheesesteak and pulled pork sandwiches; and, for the healthy set, a variety of salads.